Flossing is critical to your oral hygiene and has numerous benefits. Floss is designed to reach spots – that toothbrushes can’t – like gaps between the teeth and the gum line. It can effectively clean these hard-to-reach spots and significantly reduce the plaque and tartar build-up. There are four common varieties available – waxed, non-waxed, flavoured and non-flavoured. You can pick one as per your preferences. 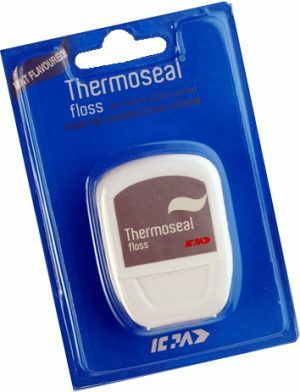 Waxed floss is easier to slide between teeth and doesn’t shred as easily as the non-waxed variant. However, both do their jobs equally well. Feel free to check out our mint flavoured floss. Take out about 18-24 inches of floss and wrap it around your middle fingers. This way, you can use your thumbs and index fingers to manoeuvre the floss for cleaning. You should have 3-4 inches of floss between your thumbs and index fingers. You can start with any tooth you want to as long as every tooth is covered. Now, slide the floss between your teeth using a gentle sawing motion. Do this until the floss reaches the point where your teeth touch each other. It is important that you don’t push it too aggressively or you will injure your gums. Once the floss is between your teeth, curve it around the tooth and go slightly below the gum line. Now, make a C-like shape and slide up-and-down a few times. Once you’re done, repeat the same process for the other side. Before moving on the next tooth, make sure you unravel the extra floss wrapped around your index finger and use a clean piece for every tooth. If you see bleeding occur, don’t stop, as it is a sign that your teeth need flossing more often. If you do it regularly, bleeding and swelling (if any) will reduce. Rear molars are harder to reach and more cumbersome to clean. But they are also the most common site for tooth decay and gum diseases. Which is why, it is imperative to pay special attention to them. Rinsing your mouth with a mouthwash will help expel any particles stuck between your gums. In addition, it keeps bad breath at bay and gives you a fresh feeling. Using a chlorhexidine mouthwash will also kill any bacteria in your mouth. As per a poll conducted by mouth healthy.org, 53% respondents said they brush before flossing. None of the practices, flossing before and after brushing, are wrong. However, if you floss first, more fluoride from the toothpaste will be able to reach between the teeth, making brushing more effective. It should be noted that cleaning your teeth shouldn’t be painful. While flossing too hard isn’t recommended, doing it too gently will not have the desired effect either. If you just started flossing, it is normal to experience some discomfort. You shouldn’t give up and maintain comprehensive oral hygiene. However, if you still experience pain after 2 weeks, please consult your dentist. 5 Brushing Habits to Keep in Mind while Brushing Your TeethHow to Use Interdental Brushes?